Smithereens is an on-going series of screen prints and drawings that examine what’s left after catastrophic events have passed. Lisa Neighbour is a cyclist and a runner and often notices the shards of glass and car-parts that are scattered everywhere – they are evidence of the frequent collisions that happen in the city. Neighbour has been collecting the pieces, drawing them, and then making prints about the damaged vehicles and their scattered parts. 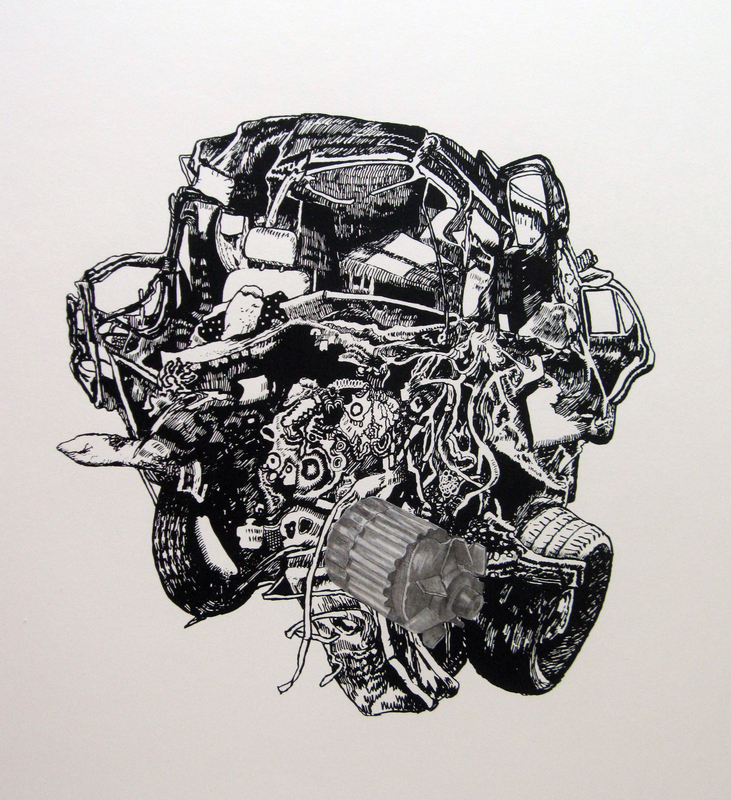 During her YYreZidency, she is setting up a drawing generator consisting of a 4’X8′ white-board platform, a selection of found car-parts, and a supply of black dry-erase markers. Visitors to the gallery will be invited to use the car-parts and markers to create drawings that she will document and then erase. The surface of the platform will be projected onto the gallery wall, and then photographed. During and after the residency, Neighbour will incorporate the resulting imagery into her screen prints and drawings. Neighbour’s goal is to develop a visual language that can examine traumatic experience in a way that she (and other people as well) will understand and perhaps benefit from. This process involves becoming conscious of, accepting, and then being at peace with the traumatic events that are part of human experience. LISA NEIGHBOUR was born in Montreal, Quebec. She graduated from OCADU in 1982 and received an MFA from York University in 2009. Neighbour is represented by Katharine Mulherin Contemporary Art Projects, in Toronto. Her recent exhibitions include: This is My Punishment, (solo) G Gallery, Toronto, Micah Lexier: One, and Two, and More than Two, (group) The Power Plant, Toronto, Pilot X: Death in the City, (group) LE Gallery, Toronto, Beyond in Western New York, (solo) at The Carnegie Art Center in Tonawanda, N.Y. and Bite the Dust, (solo) at Katharine Mulherin Contemporary Art Projects. Neighbour currently lives in Toronto and is a member of the faculty of the Art and Art History Program, a joint program between Sheridan College and University of Toronto, Mississauga. Lisa Neighbour would like to thank Carlo Cesta, Jennifer McMackon, Lee Goreas, Katharine Mulherin, Ana Barajas, and the YYZ Board Members. YYZ would like to acknowledge the support of the talented members of the Sid Lee Collective without whom this exhibition could not be possible.